Cycled on channel three of the PCBA 5010-4 battery tester were a pair of series connected Nickel Metal Hydride cells from Sanyo, part number HR-AU, that gave a nominal battery voltage of 2.4 Volts and a typical capacity rating of 2,700 mAh at the C/5 discharge rate with a minimum capacity rating of 2,450 mAh according to the manufacture’s datasheet. 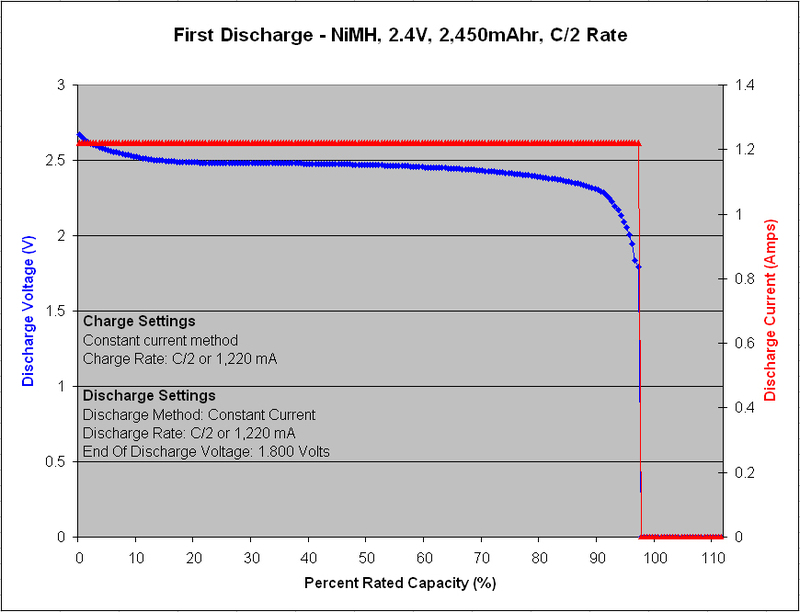 However, during the very first discharge cycle of the Prime function, the highest capacity achieved (at the C/2 discharge rate) was only 2,460 mAh or 100.4% of the minimum rated capacity. At a lower C/5 discharge rate the battery’s capacity would have probably achieved a few percentage points higher, closer to the 2,700 mAh manufacture’s rating. 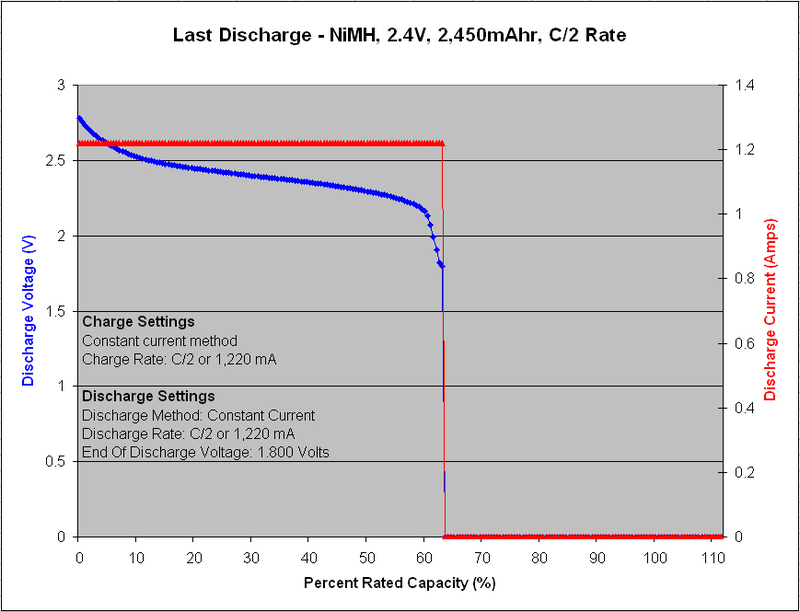 Regardless, the capacity quickly fades by 13% after only 50 cycles such that by discharge number 50, at the C/2 rate, the capacity falls to 2,131 mAh or 87.0% of the minimum 2,450 mAh rating. 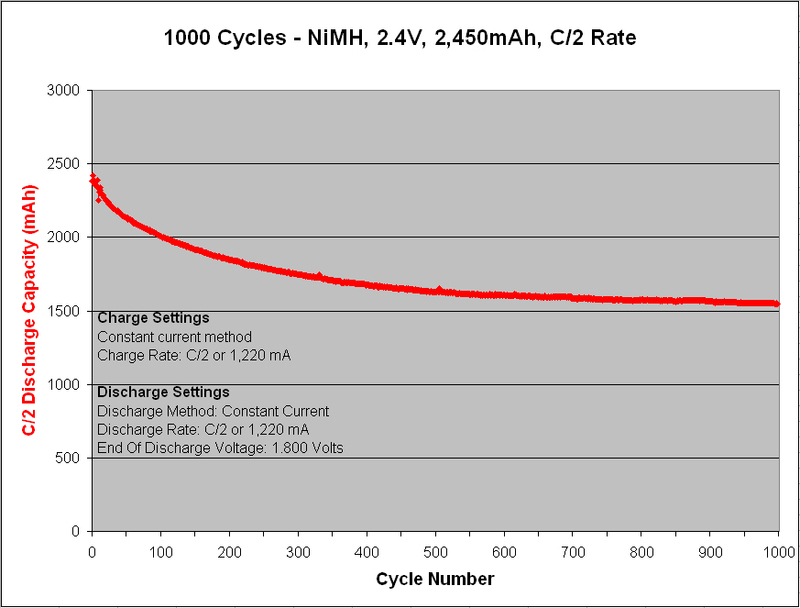 Following a few initial prime cycles on the pair of brand new cells, Figure 1 shows the first discharge capacity and voltage profile result of the life cycle test. The capacity is seen to be 2,381 mAh or 97.2% of the 2,450 mAh minimum rating and the voltage holds fairly flat above 2.4 Volts for most of the curve. The final discharge capacity after 1,000 cycles was only 63.1% with a fairly sloped voltage profile. The life cycle test results were overall quite good. To reach 1,000 cycles at 100% DoD and still have over 60% capacity remaining is not bad. With only two cells in series it’s very easy to keep the two cells balanced such that neither cell is subject to abuse. Problems often arise in higher voltage NiMH battery packs when numerous cells are connected in series to obtain higher nominal voltage. It often leads to a cell imbalance problem where the lowest capacity cell begins to suffer the deepest discharge stresses and poorer charge acceptance that can rapidly degrade the cell’s capacity and quickly limit the overall cyclic performance and capacity of the pack. Another reason for the good results is likely the quality of the charger and the algorithm used for full charge detection without overcharge in the PCBA 5010-4 battery analyzer. Also, a very important factor with NiMH batteries is the physical arrangement of the cells within the pack for thermal reasons. I’ve seen many packs over the years with multiple cells connect in parallel or series – often bundled in a spiral arrangement – to increase the capacity and voltage of the pack. The result is cells wrapped in cells with little surface area for removal of heat. Problems then arise during high rate charging because NiMH cells are exothermic on charge – meaning they give off heat – possibly resulting in a significant temperature rise affecting the pack’s voltage enough to make full charge detection by voltage only methods very difficult. Poor full charge detection then results in frequent overcharging and excessive heating of the pack which shortens cell life. The overheating is especially troublesome for cells packed in the middle of the battery where the temperature rise can be most significant; leading to cell imbalance problems once again, rapidly degrading the whole pack. To sad you didn’t continue the NiMH cycle test until its capacity had declined as low as the Li-Ion cells. It might be that NiMH could reach 2-3K cycles before rendering completely useless. It might take 2-3000 cycles before a NiMH battery will not accept ANY charge at all, but if the battery is in a piece of intelligent equipment that shuts off when the battery gets to a certain level of depletion such as electric toothbrushes and shavers then this is probably irrelevant for all intents and purposes.